4 March in Francavilla di Sicilia (ME ): “The Cianciùta” : Traditional and hilarious popular farce symbolizing the “funeral” of the King of Carnival, symbol of lust and transgression. 9 March in Catania : “A Fera Bio “: organic products directly from farmers , crafts , responsible tourism, fair trade, music and tastings, as every second Sunday of each month. 9 March in Castronovo di Sicilia : Feast of St. Basil Vitale: The “Triumph ” : the procession of Saint Elia , grand-son of the saint. From 17 to 19 March in Guliana (PA): Feast of Jesus Child – During the 3 days preceding the feast of Saint Joseph, Jesus Child is celebrated. “U Bamminu ” is carried in the arms of local carpenters , at the homes of newlyweds . 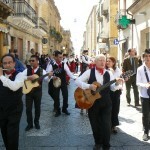 21/23 March in Centuripe (FR) : Festival of the red Orange of Sicily. The town of Enna celebrates this delicious and healthy fruit for 3 days. Wine tasting and specialties made with orange . 21/23 March in Niscemi (CL) : The artichoke Festival – Wine tasting and typical dishes , guided tours , art and music , entertainment , crafts in the streets of the city. 22/23 March: XXII edition “Spring FAI ” 2014 edition : Special opening of many monuments in Italy. 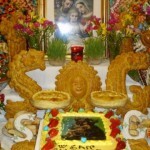 March 22 in Scicli (RG) : Feast of St. Joseph. Appointment with the traditional folk ride with the historical reenactment of the Bible of The Holy Family fleeing into Egypt . A great parade of horses richly caparisoned in the streets of downtown . 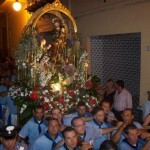 22/23 March in Valguarnera Caropepe (FR) : Feast of St. Joseph – Religious tradition and folklore make the feast of Saint Joseph of Valguarnera Caropepe, one of the most beautiful and fascinating Sicilian festivals. 29/30 March in Capo D ‘ Orlando (ME ): ” Make your mark ” – Street Art Festival. First edition that allows the dissemination and promotion of contemporary Street Art . Last Friday of March in San Marco D’Alunzio (ME) : Feast of the Holy Cross in San Marco D’Alunzio – traditional penitential procession of the faithful ” babbaluti”: thirty colleagues with long coats and purple headgears carry the fercolo of the Holy Cross .